With spring and summer coming, wedding season is coming too. So here is a selection by Girl Meets Dress of wedding guest dresses that would look beautiful for a spring/summer wedding. This lacy dress is perfect for a wedding outfit. A floral dress is also perfect to wear at a wedding. This printed wedding dress is very nice. This an unique dress that will impress all your friends. This long wedding guest dress is great for a wedding. A purple dress is perfect for the spring and summer season. This long sleeve wedding guest dress is very light and great for the hotter months. This body con wedding guest dress is very classy and perfect for a wedding. Tags: How to Wear it. designer dress hire, Designer dresses, Dress Hire, Dresses, dresses for summer wedding, dresses for wedding guests, Girl Meets Dress, Hire dresses, london wedding, Rent designer dresses, rent dresses, short dresses, wedding, wedding dresses for the UK, Wedding dresses London, Wedding dresses perfect for spring/summer 2014, wedding guest dress. Welcome to our Wedding Boutique! Brides, we want to cater for your every need here at Girl Meets Dress. With our online boutique the stress of wedding dress shopping is eliminated. You can browse our range of wedding dress designers from the comfort of your home, choose your favourites and we’ll send them to you to try on. You can choose our advance try on service to make sure you find the right wedding dress in enough time before the big day. We then re delivery your chosen dress in time for the occasion. With great discounts on designer weddings dresses, you can save money by hiring with us and forget attending any crazy wedding dress sales! We have traditional white wedding gowns and lace wedding dresses. But today we’re showing you that weddings don’t always have to mean white dresses! White may not compliment your complexion, you may be getting married for a second time so do not want to wear white or maybe you just want to be a bit different! We have red wedding dresses, pink wedding dresses and silver wedding dresses. You can find a colour to suit you and the theme of your wedding. We endorse that as long as you feel amazing in your dress it doesn’t matter if it’s a traditional wedding dress or not! 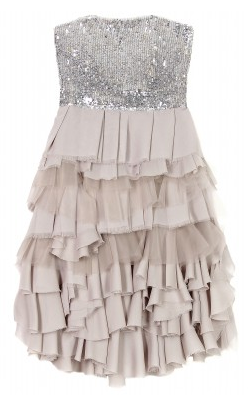 The Diva Sophia Blake Gown is encrusted in silver sequins and has a floaty semi sheer skirt. This is a beautiful wedding dress that will suit any age and is perfect to transfer from the ceremony to the evening reception to celebrate in style! This glittery number will make you sparkle as you walk down the aisle. At only £49 to hire, this is one of our cheap wedding dresses! The Omar Mansoor Beaded Strap Gown is a gorgeous sage green wedding dress is metallic hues. This vintage inspired dress also has beading detail and a large oval broach for those important details that finish off a dress and make it special. This gown is perfect for a wedding at a stately home or castle. The champagne Amee Lou Violet Dress sticks to wedding dress conventions abit moe in its light colour. However the off the shoulder style and the ruffled skirt give it a romantic boho feel perfect for an outside summer wedding. You could even wear sandals with this one and rock the bohemian bride look! Tags: Features. amee lou, Bridal dress, Bridal dress designers, bridal dresses, Bridal dresses London, Bridal dresses online, Bridal dresses UK, Diva Sophia, Dream wedding dress, lace wedding dress, lace wedding dresses, Omar Mansoor, red wedding dresses, wedding dress, Wedding dress designers, Wedding dress hire, wedding dresses, Wedding dresses 2014, Wedding dresses London, wedding dresses UK, Wedding gowns, wedding ideas. Forget the wedding dress – what about the engagement party dress!? We all know that wedding’s are really all about the bride and that all important wedding dress. After hunting high and low for the perfect dress and spending a fortune on it…you may also want to consider a dress for your engagement party? The evening of the wedding when you put your dancing shoes on? Or even the morning after? We have a gorgeous collection of designer white dresses perfect for all these occasions as well as a complete section dedicated to weddings. The Elliot Clare dress is a cream toned, full-length gown with embellished shoulders and jewelled bodice forming an adorable low cut cowl neckline – perfect for a glamorous engagement party. 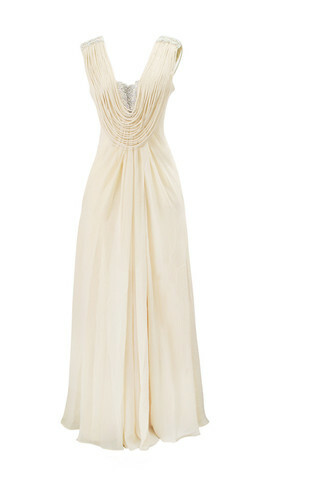 This Alice and Olivia dress is perfect for the bride in the evening to let her hair down and dance the night away. Wedding dresses can be ever so heavy and restrictive – this beautiful designer dress will still ensure that all eyes are still on you! The Pippa Swarovski dress by Gorgeous Couture has swarovski detailing around the cowl V-neck which exudes elegance. This dress is perfect for a pre-wedding party or even the morning after if you’re having breakfast with guests at the hotel. We have thought of everything here at girlmeetsdress and have collections for the mother of the bride, wedding guests and even the honeymoon. Wedding’s are expensive and here you have the option to save a little extra cash but still look drop-dead gorgeous. Tags: Features, Uncategorized. Alice and Olivia, alice and olivia dress, Bridal dress, Bridal dress designers, bridal dresses, Bridal dresses London, Bridal dresses online, Bridal dresses UK, designer white dresses, Dream wedding dress, elliot clare, Gorgeous Couture, lace wedding dress, lace wedding dresses, mother of the bride, pippa swarovski, red wedding dresses, the honeymoon, wedding, wedding dress, Wedding dress designers, Wedding dress hire, wedding dresses, Wedding dresses 2013, Wedding dresses London, wedding dresses UK, Wedding gowns, wedding guests, wedding ideas, weddings. You can go to a posh wedding boutique and sip champagne whilst you try on expensive wedding dresses but then the real shopping starts when you enter our online wedding boutique. Those beautiful, budget-breaking, designer wedding dresses you hesitantly took off whilst masking your tears can now be yours for a fraction of the price with wedding dress hire from Girl Meets Dress. Our online wedding boutique gives you the chance to shop from the comfort of your home – you can still drink champagne but just wear your slippers at the same time! We have fabulous wedding ideas for you at affordable prices with an advance try on service to allow you to decide on your perfect dress before your big day. We then re delivery your chosen wedding dress in time for your wedding day. Browse our wedding boutique for bridal dresses of every kind including lace wedding dresses, sequinned wedding dresses, pink wedding dresses and long wedding dresses. We have wedding gowns for every woman from the best wedding dress designers. First is the Gorgeous Couture Bailey Maxi in blush which creates the perfect grecian goddess wedding look. Next The NLY Iona Gown is an elegant wedding dress with a daring plunge neck. Finally our Ariella Sequin Fishtail Gown is the ultimate bridal dress that oozes glamour. Worn by celebrities such as Myleene Klass, this wedding dress will add lots of sparkle to your day! Tags: Features. ARIELLA, Bridal dress, Bridal dress designers, bridal dresses, Bridal dresses London, Bridal dresses online, Bridal dresses UK, Dream wedding dress, Gorgeous Couture, lace wedding dress, lace wedding dresses, long dresses, Myleene Klass, NLY, red wedding dresses, wedding dress, Wedding dress designers, Wedding dress hire, wedding dresses, Wedding dresses 2014, Wedding dresses London, wedding dresses UK, Wedding gowns, wedding ideas.